Revenue based loans are becoming increasingly popular for small business owners. In his most recent release Managing Partner of Bentley Capital Ventures, Nick Bentley exposes all the details of revenue based loans including what to expect and what to watch out for. Since 2009, small business loans have become increasingly difficult for business owners to obtain. In fact, the SBA's quarterly lending bulletin recently released is showing that small business lending has virtually come to hault. Due to this fact many business owners have ventured into the 3.1 billion dollar arena of private loans. These private loans are becoming more and more popular due to the flexible guidelines and ease at which business owners can be approved for short term business loans. The flexible guidelines include the ability for entrepreneurs to access small business loans for bad credit. They do this by determining the amount to lend based on the average amount of revenue the business owner is generating on a monthly basis. In speaking with Bentley Capital Ventures' managing partner, Nick Bentley, he states that "Business owners can be an attractive lending risk regardless of personal credit history. Our goal is to provide small businesses with the opportunity to access capital to grow their business and provide a service to their community." After looking through many of the case files and portfolios of business owners being approved and funded, many had regular recurring revenues though their personal credit was less than 700. There were businesses funded across multiple niche's and it seemed to be true that as long as the business could show sustainable revenue over a year or so, the majority of applications were being approved. Due to the influx of business owners literally fleeing the small business administration to acquire these loans Mr. Bentley has put together a resource for small business owners to understanding exactly what they should anticipate when applying for these types of small business loans. The Definitive Guide To Revenue Based Loans depicts every aspect from terms and conditions, to approval rates, the underwriting process, and specifically, what business owners should watch out for on the back end. Though private lending has becoming the primary financial vehicle for small businesses, there are still many aspect to the loan business owners should be aware of. "We want to ensure every business owner has a great understanding of how these types of loans work. Many small business owners are too busy in the day-to-day operations of business to worry about details of financing. This is one easy to read guide that covers all aspects," states Bentley. This is extremely relevant for small business owners who have been turned away by the banks looking for financing. This resource should provide business owners with everything they need to know. 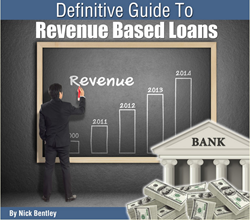 To find out more on the Definitive Guide to Revenue Based Loans, you can visit http://bentleycapitalventures.com/2014/05/27/the-definitive-guide-to-revenue-based-loans/.